After losing to the Arizona Cardinals last week, the Seattle Seahawks have a third and final chance to clinch the NFC West division title and home field advantage throughout the playoffs this week against the St. Louis Rams. The Seahawks come into this week’s game at 12-3 after last week’s loss and the Rams enter Seattle having won 4 of their last 6 games. The Seahawks lead the all-time series with the Rams 19-12 and have won the last two games including a 14-9 win in week 8 in St. Louis on Monday Night Football. It is also noteworthy to point out that the Rams currently have an 8-game losing streak in Seattle. Their last win at CenturyLink Field came on January 8th, 2005 in an NFC Wild-Card playoff game. This week’s game has become the biggest game of the season and I expect and anticipate a playoff-type atmosphere on Sunday. This is what will be in the way and what the Seahawks must do to be the 2013 NFC West champions. Forget about how well the defense played. Forget about the bad calls that went against us. The primary reason why we were unable to win and clinch last week was the inept play by the Seahawks offense. Protecting quarterback Russell Wilson is by far the most important thing the Seahawks must do in order to be successful this week. J.R. Sweezy has been practicing this week and it is logical to believe he will be back starting at right guard, adding stability to a position that was a brutal weakness last week with Michael Bowie filling in. As important as the running game will be with Marshawn Lynch this week, it is the Seahawks passing game that will need to step up to move the ball in chunks, extend drives, and get into scoring range on a more consistent basis. Last week Arizona forced 7 Seahawks three-and-outs, which was a significant factor in Arizona being able to control the clock and tire our defense out. If the Seahawks offensive line does a sub-par job protecting Wilson, look for the Seahawks to utilize a screen pass package that could feature Golden Tate on bubble screens and Marshawn Lynch on conventional screens out of the backfield. The Seahawks defense has not allowed more than 20 points in a game since before the bye week. This week, in an effort to improve exposed aspects of our defensive game plan last week, it is imperative that the Seahawks must be able to stop Rams running back Zac Stacy. Stacy has been on a tear as of late, running for 133 yards and 104 yards in the last two weeks respectively. Stacy also ran for his season high 134 rushing yards against the Seahawks back in October. Although St. Louis quarterback Kellen Clemens has been playing decent football since starting quarterback Sam Bradford got hurt that does not diminish the fact that Clemens will have to play in front of a revved up 12th Man that will be at full roar on Sunday hoping to boost the Seahawks into the division title. The Seahawks have intercepted 9 passes in their last two games and putting pressure on Clemens could significantly up that number this week. This is why Stacy becomes such a viable weapon for St. Louis and by eliminating Stacy’s production and forcing Kellen Clemens to throw will give the Seahawks a tremendous advantage this week. Look for the Seahawks pass rush to also make an impact on the left side of the Rams offensive line, as starting left tackle Jake Long is out for the season. Rodger Saffold will start in place of Long this week. The last time these two teams played, the St. Louis Rams defense did a surprisingly incredible job of shutting down a Seahawks offense that had been rolling in their previous few games. It was this game that the Seahawks were unfortunately introduced to defensive end Robert Quinn. Quinn is currently the NFL leader in sacks with 18, racking up 5 sacks in his last two games, thus he comes into Seattle very hot. The way the Rams control this game is to make life miserable for Russell Wilson. And the way Seattle blocked against Arizona will not cut it this week as the Rams pass rush may be one of the league’s best right now. The Rams like to use pressure early and they will use packages that include Quinn, defensive end Chris Long, defensive end William Hayes, and defensive tackle Michael Brockers. Quinn will be the primary focus of the Seahawks offensive line and it would not surprise me to see Quinn line up at defensive tackle to try to penetrate the soft spots in the Seahawks offensive line. Double teaming Robert Quinn will be necessary at times but being able to harness the rest of the Rams pass rushers will make it easier for the Seahawks to take care of Quinn. On offense for the Rams there will be a gigantic emphasis on the running game because St. Louis averages less than 200 passing yards per game this season. If the running game cannot pick up steam, quarterback Kellen Clemens will be forced to throw. Much like how I think Russell Wilson and the Seahawks offense can effectively run screen passes this week, I think the same goes for the Rams. Kellen Clemens does not want to throw into the Legion of Boom and being able to play conservatively in the passing game could benefit the Rams offense overall. Using screen passes could be the best way to move the ball through the air this week and my X-Factor player to watch this week is a man who has suddenly become Clemens’s most popular target; wide receiver Stedman Bailey. Bailey is a rookie wide receiver from West Virginia and was taken two rounds after his college teammate Tavon Austin was also taken by St. Louis. With a season-ending injury to Austin, Bailey has seen significant playing time and has seen an increasing number of targets over the past 4 weeks. Last week Bailey led all Rams receivers in targets with 5, catching 3 of them for 44 yards. 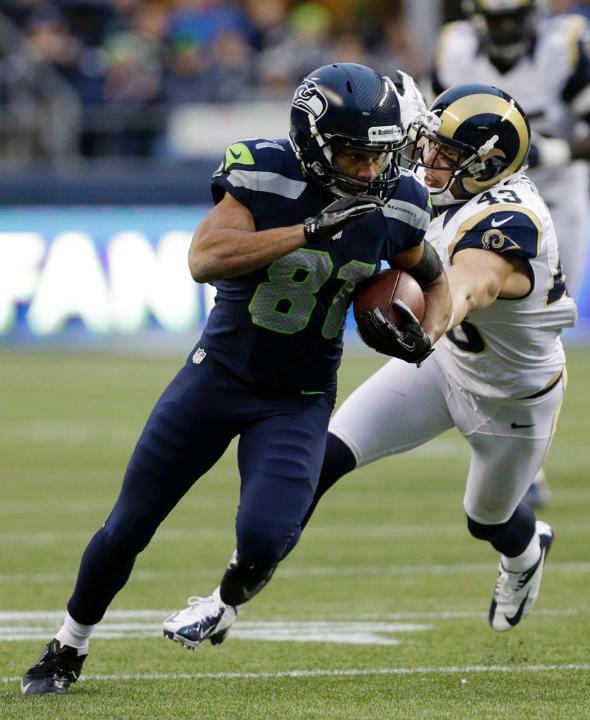 Bailey is short yet quick and I consider him a possible Doug Baldwin/Golden Tate hybrid. Using Bailey in the quick passing game is what I will look for this week while the Rams are on offense. If the Rams decide to throw bubble screens, expect Bailey to be the top target on the outside. Like I previously stated earlier in this post, after last week’s loss the sense of urgency this week has blossomed from easy comfort to overblown panic. To all of the fans, especially those attending this week’s game, I remind you that we still control our own destiny but the Seahawks need us to do our part now more than ever. The 12th Man needs to enter CenturyLink Field on Sunday with the belief that this is a playoff game. I expect an extremely loud atmosphere (even for a Sunday afternoon game) that will make St. Louis struggle as badly as San Francisco and New Orleans did in primetime atmospheres. Plain and simple, this is a playoff game. Get to your seats with plenty of time to spare during pregame and cheer and yell like it is a playoff game. Random Thoughts: This week’s game theme is fan appreciation and the Seahawks will be giving away tons of prizes throughout the game. I haven’t won anything on fan appreciation day since 2008… Last season the Seahawks chose 60 season ticket holders randomly to be on the field for player introductions. If they are doing it again this year I didn’t get picked. Oh well… The Seahawks will wear all blue this week and the Rams will likely wear white jerseys and white pants… Chris Myers and Tim Ryan will broadcast their final Seahawks game of the season this week on FOX… Jeff Triplette is this week’s referee. Triplette’s crew has been rather controversial this year. In a Sunday night game between the Giants and the Redskins a few weeks ago, Triplette’s crew incorrectly told Redskins coach Mike Shanahan that they moved the chains for a first down but they really had not gained enough yards for a first down. The Redskins could not convert and the Giants won the game… This week I am taking my sister to a Seahawks game for the first time since her birthday in 2008. This is also the first time I’ve taken a family member other than my Dad to a game since then. She recently turned 21 so I will be able to show her what a normal gameday is like when I take my friends. Pregame at the Hawks Nest Bar starts at 9am… Shortly after the afternoon slate of games the NFL usually releases the schedule for both Wild-Card weekend and Divisional weekend. The Seahawks will likely know what day and what time they play their first playoff game by 5pm Sunday night. Congratulations to Russell Wilson, Marshawn Lynch, Max Unger, Richard Sherman, Kam Chancellor, and Earl Thomas for being named to this year’s Pro Bowl and congratulations to Russell Okung, Golden Tate, and Steven Hauschka for being named Pro Bowl alternates. However, hopefully they trade their trip to Hawaii for a trip to New York to play in the Super Bowl instead. Seahawks Playoff Outlook: As we enter the final week of the regular season there are 3 scenarios that could determine the Seahawks road to Super Bowl XLVIII. Scenario #1: A Seahawks win clinches the NFC West and home field advantage throughout the NFC Playoffs. Scenario #2: A Seahawks loss and a 49ers loss to Arizona clinches the NFC West and home field advantage throughout the NFC Playoffs. Scenario #3: A Seahawks loss and a 49ers win over Arizona clinches the NFC West for San Francisco; the Seahawks would be the #5 seed in the NFC Playoffs. The NFC North and NFC East division titles will be decided by win-or-go-home games that will determine who will be the #3 and #4 seeds. The Carolina Panthers can clinch the NFC South and the #2 seed with a win over Atlanta. The New Orleans Saints can clinch a playoff spot with a win over Tampa Bay. New Orleans wins the NFC South with a win and a Carolina loss. Here are this week’s games with NFC playoff implications. Teams to note are bolded. Prediction: This game will feature shades of our first game against St. Louis and last week’s game against Arizona. The Seahawks offense will struggle to get going and the Rams will have the lead at halftime. A couple of big gains in the passing game and a touchdown run by Marshawn Lynch from just outside the goal line will give the Seahawks a late lead. The defense will play a consistent game throughout the day and they will step up when we need them to the most. The Rams will need to put together a touchdown drive in the final minutes to win the game but Richard Sherman will pick off Kellen Clemens, giving the Seahawks the win, the NFC West title, and home field advantage. Check back for my Rams/Seahawks review as well as a brief outlook on the start of the NFL Playoffs on Sunday night. Thanks for reading and enjoy the game. Go Hawks!